The kitchens at yök Casa + Cultura are designed to look like a nice piece of furniture, because they are situated in the living room, as guests tend not to cook 5 course meals but rather prepare easy meals and breakfasts. 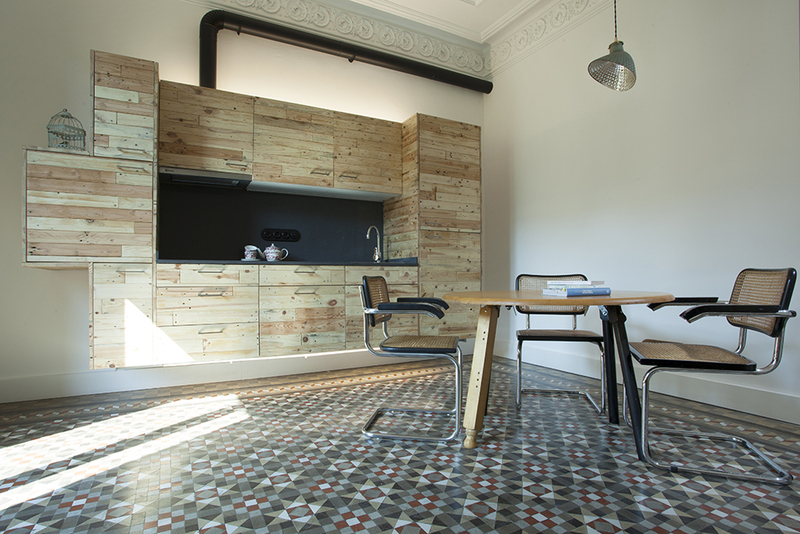 The floating effect helps to make the original floors and ceilings from 1900 stand out. All kitchens are fully equipped with second hand crockery and glassware, recycling bins, organic products like olive oil, eco-friendly cleaning products from the taps of Goccia Verde and an honesty mini-bar with local food products. The cupboard doors are made from used pallets, and the countertop is ECO by Cosentino, manufactured from 75% of recycled materials such as mirror, glass, porcelain, earthenware and vitrified ash. LED stips iluminate the countertop, and a seperate line above and below the cupboards serve as the light source for the living room, illuminating the original mosaic floor and ceiling. The PVC free switches and plugs are made locally from porcelain by Fontini. All of the materials are chosen for their durability and low maintenance. The appliances are A+ certified to use as little energy as possible. More about how our guests save energy here. The kitchen faucet is by the same series as our bathroom’s, L20 by Roca, equipped with aerators and Cold Start. We serve complimentary filtered tap water in reusable glass bottles from our office upstairs. Jute shopping bags help guests go shopping without plastic bags. Check out 10 ways to make your kitchen more green for more ideas!